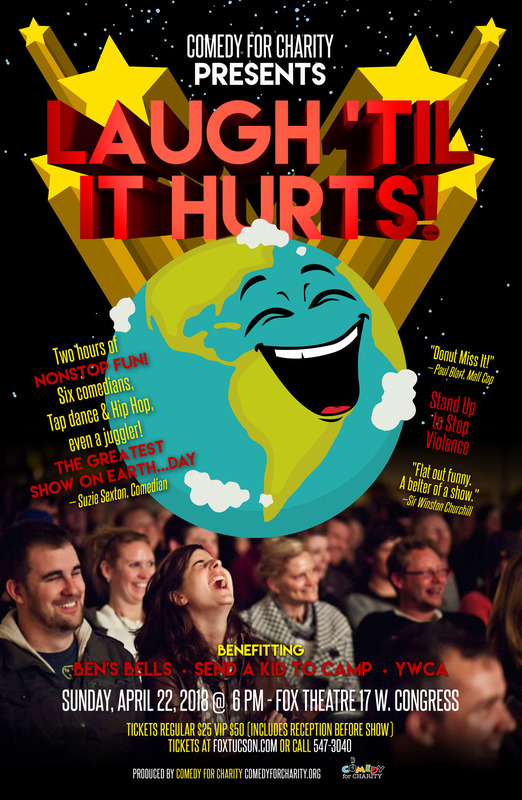 Comedy for Charity is proud to present Laugh ‘til It Hurts, a two hour event of nonstop entertainment featuring seven comedians, two dance troupes, and even a juggler. The event will be on Sunday, April 22, 2018 from 6:00 pm – 8:00 pm at The Fox Theatre. This special one night event will raise money for violence awareness and prevention. “This show will be hilarious, and it’s all for a wonderful cause—to make our community a safer place. The mission is to raise a lot of money to help prevent violence and to spread awareness about the problem of violence. We want people to ‘give ‘til it hurts,” shared Suzie Sexton, executive director of Comedy for Charity. We are also delighted that Mayor Johnathan Rothschild, Lianne Hernandez and Alba Jamarillo are Honorary Chairs of the event. Laugh ‘til It Hurts features headliner Jason Love from Thousand Oaks, CA. Love is one of today’s best clean comedians and has appeared on HBO, Comedy Central, America’s Got Talent and over 20 national broadcasts. He engages the audience, plays music and is a favorite presenter for companies like Google, Chevron, Farmers and Costco. Local celebrity David Fitzsimmons will be the emcee for the evening. Additional talent includes feature comedian Henry Barajas, a Tucson favorite who now resides in Los Angeles; Nancy Stanley, creator of The Estrogen Hour; Elliot Glicksman, attorney and comedian; Linda Ray, writer and comedian; Suzie Sexton, comedian and event producer; a dance performance by senior tap group The Rodeo City Wreckettes; Hip Hop; and a juggler. Comedy for Charity founder Suzie Sexton is a comedian, writer and producer. Her sister was murdered in an unsolved mugging in Chicago in 1980. Since then, she has worked and volunteered in various capacities to reduce violence. Her fundraisers have raised money and awareness for charities such as Emerge! Center Against Domestic Abuse, Tucson’s January 8th Memorial Foundation, Dancing in the Streets AZ, Hope for Haiti, Shared Hope, The Tucson Musician’s Museum, and Social Sitter. The show starts at 6:00pm. Doors open at 5:30pm. A $50.00 VIP option includes upgraded seating, reception with appetizers, and a meet and greet with the entertainers an hour before the show. General admissions tickets are $25.00. Tickets can be purchased at the Fox Theatre Box Office, 17 W. Congress; on the Fox Theatre website; or by phone at (520) 547-3040. Help spread the Comedy for Charity mission by liking us on Facebook! Copyright © 2015 Comedy for Charity. Website by Tucson Website Design.